1. In the accelerated state, close the process and return to the game. At this time, the accelerated time will be cleared completely. . 2. Offline revenue interface, click on the "return" virtual button of the device. At this time, revenue will not increase to the problem of gold coin . 3 and SDK initialization twice. Have you ever wanted to have your own puppy but can’t achieve it so far? 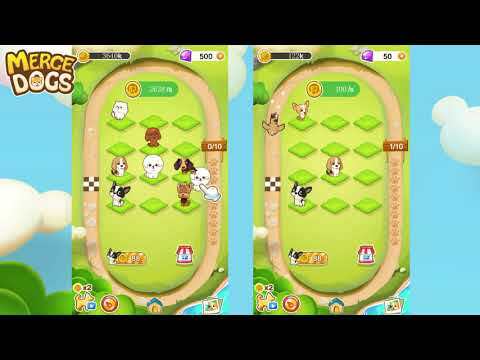 Now you have the opportunity.Welcome to the Merge dogs-idle&breed—— PUPPY MANOR, you can earn money and choose the smartest strategy to get more breeds puppies here.Features√ I... see more Have you ever wanted to have your own puppy but can’t achieve it so far? Now you have the opportunity. Welcome to the Merge dogs-idle&breed—— PUPPY MANOR, you can earn money and choose the smartest strategy to get more breeds puppies here. Merge dogs-idle&breed is a completely easy and relaxing casual game to meet all your needs. This game won&apos;t take you much time with the idle system. It makes your puppies race automatically and earn money in seconds. You can get money even when you are offline. Puppies with higher level will earn more money. Whenever you are waiting for the lift, stuck in traffic, taking break from work or unable to sleep at night, this is the best leisure game you can have to pass your time.